A shocking new discovery has added yet another health benefit to the impressive resume of vitamin C. Researchers have determined that the super vitamin can kill drug-resistant strains of tuberculosis. Here’s what you need to know about this treatment for tuberculosis. Already proven to fight against cancer, immune deficiencies, cardiovascular disease, eye disease, and even aging skin, vitamin C might also be the answer to fighting the respiratory disease ailing millions across the globe. The latest numbers from the World Health Organization indicate tuberculosis affected 8.7 million people and took the lives of 1.4 million in 2011. What’s become an increasing problem, however, are new strains of the bacteria that don’t respond to current treatments. These cases were responsible for 650,000 deaths. It’s vital that researchers find an appropriate treatment for tuberculosis, especially as new strains of the virus appear. Researchers wanted to learn why certain forms of tuberculosis were resistant to the drug “Isoniazid.” Upon examination, they noticed the drug was missing a common molecule so they added the amino acid cysteine. They thought the bacteria would resist, but it was surprisingly killed. Based on these results, they hypothesized the cysteine helped kill the tuberculosis bacteria by stopping the production of free radicals, which can damage DNA. Next, they tested the effect of vitamin C, which is high in antioxidants that inhibit free radicals. The results were the same—the vitamin C sterilized all strands on its own! This could lead to a major breakthrough in treatment for tuberculosis and drug manufacturing in the future. 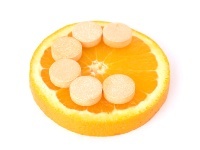 By adding vitamin C to medication, it’s possible these drug-resistant strains can be treated. As of right now, the effects of vitamin C have only been realized in a lab setting and still need to be tested on humans. Vitamin C has numerous health benefits and can be taken as a preventative measure—or used as treatment—for a number of conditions. It is a safe nutrient and, when taken in abundance, can offer health benefits. However, getting enough vitamin C can be difficult. The recommended daily intake for vitamin C is 75-90 milligrams (mg) per day, but to truly achieve health results you need more like 500 mg per day! As you can see, that’s quite a discrepancy. The best way to get there is to eat four or five servings of fruits and vegetables per day and take a supplement if you’re not getting enough vitamin C from your diet. If you consume a lot more vitamin C, then make sure you’re not exceeding more than 2,000 mg of vitamin C a day, since studies have found harmful effects due to overdosing on vitamin C.
To achieve the best results, get your daily recommended intake of vitamin C. Not only might it be a great treatment for tuberculosis, it’s also an essential nutrient your body needs. Ehrlich, S., “Vitamin C,” University of Maryland Medical Center web site, July 7, 2011; http://www.umm.edu/altmed/articles/vitamin-c-000339.htm, last accessed May 24, 2013. Jacobs, W., “Study Finds Vitamin C can kill drug-resistant TB,” Albert Einstein College of Medicine, Yeshiva University web site, May 21, 2013; http://www.einstein.yu.edu/news/releases/907/study-finds-vitamin-c-can-kill-drug-resistant-tb/, last accessed May 24, 2013.